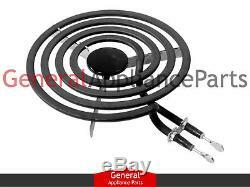 Whirlpool Maytag Magic Chef Jenn-Air Range Stove 6 Surface Burner Y04000034. This 6 burner element has 4 turns/rings and has a Y-Frame structure to support the element. This burner element is rated at 1500 watts. The wire looped terminals have been replaced with these solid terminals. This element also replaces some flat style terminal elements. Whirlpool Estate KitchenAid Roper Maytag Admiral Amana Speed Queen Jenn-Air Magic Chef Crosley Caloric Glenwood Hardwick Menumaster Modern Maid Montgomery Wards Norge JC Penney Wards Sears Kenmore. The surface burner elements, those metal components that get red-hot and generate heat, are the most important parts of any range. When the elements fail to heat properly, it's time to replace them. It's a simple procedure any electric stove owner can easily accomplish in a few minutes' time. You can usually identify a burnt-out element by blistering or small holes on the element's coils. A burner that plugs into a receptacle is easy to test, just unplug the non-heating burner, plug it into another working receptacle, restore the power to the range, and test it. If the burner works, you know its original receptacle is probably faulty. If it doesn't work in the good receptacle, the burner is bad and must be replaced. Do not be alarmed if a new element smokes a little when you first use it. 660532 Y04000034 14210026 258897 308378 308381 309191 309192 309249 309250 309251 309334 313964 313967 313968 3195919 3196204 4179293 4315241 4315585 4320501 4371353 4371427 4371947 4372158 4372377 4372607 4378605 660528 660529 786186 8053266 865691 865693 865694 865695 866397 866446 868445 868590 877981 877982 877985 FSP660532 SU233 TS4W6215 3196680 4W6215 SU235 14201046 1938218 1938250 1938252 1938284 1938305 1938343 1938355 19950006 332-219 561103 74004485 74007161 7406P018-60 7406P027-60 7406P037-60 7406P054-60 766328 W10126573 Y04000032 Y0E00600699 Y0E00600799 Y0E00600899 Y0E00601599 Y0E00602099 Y0E00602399 660532BULK. 1068F-CZ 1151AA-36 1151AA-36G 1151AD-30 1151AD-36 1151AH-36G 1151AJ-30 1151AL-30 1151AL-36G 1151WA-36 1151WA-36G 1151WD-30 1151WD-36 1151WH-36G 1151WJ-30 1151WL-30 1151WL-36G 3542XRA 3542XRW 35FA-2CX-ON 35FB-2CX-ON 35FG-2CX-ON 35FN-2CX-ON 35FY-2CX-ON 35HA-2CLX-EC 35HA-2CLX-ON 35HA-2CW 35HA-2CW-DN 35HA-2CX-EC 35HA-2CX-ON 35HB-2CX-ON 35HG-2CX-ON 35HN-2CLX-EC 35HN-2CLX-ON 35HN-2CW 35HN-2CW-DN 35HN-2CX-EC 35HN-2CX-ON 35HY-2CLX-EC 35HY-2CW-DN 35HY-2CX-EC 35HY-2CX-ON 35JA-2CLX-EC 35JA-2CLX-ON 35JA-2CW-DN 35JA-2CX-ON 35JN-2CLX-EC 35JN-2CLX-ON 35JN-2CW-DN 35JN-2CX-ON 35JY-2CLX-EC 35JY-2CX-ON 3621WRA 3621WRW 3621XRA 3621XRW 3842SRA 3842SRW 3842VRV 3842XRA 3842XRW 3862XRA 3862XRW 3882VRV 3882XRA 38FA-2C 38FA-2C-94 38FA-2CW 38FA-2CX-94 38FA-2CX-MO 38FA-2CX-MS 38FA-2CX-OC 38FA-2CX-ON 38FA-2CXW 38FA-2CXW-94 38FA-2CXW-ON 38FA-42TXW 38FA-92C 38FB-2C 38FB-2CX-MO 38FB-2CX-ON 38FB-42TXW 38FG-2C 38FG-2CX-ON 38FN-2C 38FN-2CX-94 38FN-2CX-MO 38FN-2CX-MS 38FN-2CX-OC 38FN-2CX-ON 38FN-2CXW 38FN-2CXW-94 38FN-2CXW-ON 38FN-42TXW 38FN-92C 38FY-2C 38FY-2CX-MO 38FY-2CX-ON 38FY-2CXW 38FY-2CXW-ON 38HA-2C 38HA-2CW 38HA-2CX-ON 38HA-2CXW-ON 38HA-42TXW 38HB-2CX-ON 38HG-2CX-ON 38HK-2CX-ON 38HN-2C 38HN-2CW 38HN-2CX-ON 38HN-2CXW-ON 38HN-42TVW-EV 38HN-42TXW 38HY-2C 38HY-2CX-ON 38HY-2CXW-ON 38JA-2CW 38JA-2CX-94 38JA-2CX-ON 38JA-2CXW-ON 38JN-2CW 38JN-2CX-94 38JN-2CX-ON 38JN-2CXW-ON 45EA-2W 45EA-3CLW 45EB-3CLW 45EG-3CLW 45EN-2W 45EN-3CLW 45EY-2W 45EY-3CLW 4RF302BXDW0 4RF310PXDQ0 4RF315PXDQ0 4RF315PXDW0 4RF315PXEQ0 4RF315PXGQ0 4RF315PXKQ0 4RF315PXMQ0 5651XRA 5651XRS 5651XRW 5651XUA 5651XUS 5651XUW 5892VRA 5892VRV 5892XRS 58HA-2CX 58HA-2CXW 58HN-2CX 58HN-2CXW 6551WRA 6551WRW 6551WUA 6551WUW 6551XRA 6551XRW 6551XUA 6551XUB 6551XUW 655AH-CVW 655WH-CVW 65HA-3W 65HA-3X 65HN-3W 65HN-3X 664RF3020XYN1 664RF3020XYN2 664RF3020XYW0 664RF3020XYW1 664RF3020XYW2 6651XRS 6651XUS 6659898990 665AH-CV 665AH-CVW 665HH-CV 665WH-CV 665WH-CVW 6892VRA 6892VRV 6892VVA 6892VVV 6892XRA 6892XRS 6892XRW 6892XVA 6892XVS 6892XVW 68HA-3CW 68HA-3CXW 68HN-3CXW 8610PA 8610PB 8610PS 8610PT 8610PV 86HA-1 86HK-1 86HN-1 86HS-1 86HY-1 86LA-1 86LK-1 86LN-1 86LS-1 86LW-1 8710PA 8710PB 8710PS 8710PW 8710VB 8710VD 8710VS 8710VV 8720PA 8720PS 8720PW 8720VB 8720VD 8720VQ 8720VS 8720VV 87LA-1 87LA-1G 87LK-1 87LN-1 87LN-1G 87LS-1 87LS-1G 89L-4 958AF-CLW 958AF-CLZ 958AH-CZW 958AJ-ZW 958WF-CLW 958WF-CLZ 958WH-CZW 958WJ-ZW 968AF-C 968WF-C A3531WRA A3531WRW A3531XRA A3531XRW A3631WRA A3631WRW A3832SRA A3832SRW A3832XRA A3832XRW A5892XRS A6892XRS A8610PA A8610PS A8610PV A86LW-1-R A8720PA A8720PW A89L-4-R AC110B14 AC110W14 AER1350AAH AER1350AAL AER1350AAT AER1350BAH AER1350BAT AER5522VAS0 AER5522VAW0 AER5522VCS0 AER5522VCW0 B35HA-2CX-ON B35HA-92X-DGI B35HA-92X-ON B35HN-2CX-ON B35HN-92W-EV B35HN-92X-DGI B35HN-92X-ON B38HA-2CXW-ON B38HA-42TXW B38HN-2CXW-ON B38HN-42TVW-EV B38HN-42TXW B38JN-2CX-ON BNEA3H2X BNEA3H9TZ BNEW3H2WEV BNEW3H2X BNEW3H9TZ C3542XRA C3542XRW C3842XRA C3842XRW CC8610PV CCE1401B CCE1401W CCE406 CCE406B CCE406L CE35111AAA CE35111AAW CE3531WRA CE3531WRV CE3531WRW CE3531XRA CE3531XRW CE3552XRA CE3552XRW CE3832SRA CE3832SRW CE3832XRA CE3832XRW CE8610PA CE8610PS CE8610PW CEA3C6CV CEA3D3W CEA3D3X CEA3D5DLV CEA3D5DLX CEA3D5DV CEA3D5DX CEA3D5V CEA3D5W CEA3D6CV CEA4D59C0 CEA4D59CO CEA4D59CV CEA6C6CW CEC1536AAB CEC1536AAC CEC1536AAQ CEC1536AAW CEHA861 CEHW861 CELA861 CELS861 CELW861 CES365HQ0 CES365HQ1 CES365HZ0 CES365HZ1 CEW3C6CV CEW3D3W CEW3D3X CEW3D5DLV CEW3D5DLX CEW3D5DV CEW3D5DX CEW3D5V CEW3D5W CEW3D6CV CEW4D59C0 CEW4D59CO CEW4D59CV CEW6C6CW CEX210VW1 CEX210VX0 CEX310VW1 CEX310VX0 CEX630VW1 CEX630VX0 CEX650VW1 CEX650VX0 CNE200 CNE2000ACL CNE2000ACW CRE775 CSE400 CSE4000ACD CSE4000ACL CSE4000ACW CSE4000ADW CSE6010ACD CSE6010ACL CSE6010ACW CSEA300ACD CSEA300ACE CSEA300ACL DCSE400 DG210 DG212 DG308 DG309 DG412 EG971A549 EG971W549 EG972A549 EG972W549 EH4-33A9 EH4-33S9 EH4-33W9 EKG971A549 EKG971W549 EL4-33A9 EL4-33B9 EL4-33S9 EL4-33W9 EPF9-71KA669A EPF9-71KW669A EPF9-81KS9A FEC350VW0 FEP310BL0 FEP310BL1 FEP310BW0 FEP310BW1 FEP310YW0 FEP310YW1 FEP310YW2 FEP330VW0 FEP330VW1 FEP330YW0 FEP330YW1 FEP330YW2 FEP340VW0 FEP340YW0 FEP340YW1 FEP350BL0 FEP350BW0 FEP350BW1 FEP350VW0 FEP350YW0 FEP350YW1 FEP350YW2 FES310BL0 FES310BL1 FES310BQ0 FES310BQ1 FES310BW0 FES310BW1 FES310YW0 FES310YW1 FES310YW2 FES325RQ0 FES325RQ1 FES325RQ2 FES326RD0 FES340VW1 FES340YW0 FES340YW1 FES340YW2 FES350BL0 FES350BL1 FES350BW0 FES350BW1 FES355YW0 FES355YW1 FES355YW2 G-433 G-436 G3862XRA G3862XRW GA3631XUWG GCNE200 GDG210 GDG212 GDG412 GR395LXGB0 GR395LXGB1 GR395LXGB2 GR395LXGQ0 GR395LXGQ1 GR395LXGQ2 GR395LXGT2 GR395LXGZ0 GR395LXGZ1 GR395LXGZ2 H3531WRA H3531WRW H3531XRA H3531XRW H3832SRA H3832SRW IME31300 IME31301 IME31302 IME32300 IME32301 IME32302 IME32303 IME33300 IME33302 IME33303 IMP33801 IMP33802 IRE31300 IRE31301 IRE32300 IRE32301 IRE32302 IRE32303 IRP33800 IRP33801 IRP33802 IRP33803 IVE32300 IVP33800 JEA7000ADB JEA7000ADB13 JEA7000ADS JEA7000ADS13 JEA7000ADW JEA7000ADW13 JED8130ADB JED8130ADB15 JED8130ADB16 JED8130ADW JED8130ADW15 JED8130ADW16 KECM860TBC0 KEDS100SCB0 KEDS100SCB1 KEDS100VWH0 KEDS100VWH1 KEDS100VWH2 KEDS100VWH3 KEDS100WWH0 KEDS100WWH1 KEDS100WWH2 KEDS200BBL0 KEDS200BBL1 KEDS200BWH0 KEDS200BWH1 KEDS200YBL0 KEDS200YBL1 KEDS200YBL2 KEDS200YWH0 KEDS200YWH1 KEDS200YWH2 KEDS207AL1 KEDS207BAL0 KEDS207BAL1 KEDS207BBL0 KEDS207BBL1 KEDS207BWH0 KEDS207BWH1 KEDS207YAL0 KEDS207YAL2 KEDS207YBL0 KEDS207YBL1 KEDS207YBL2 KEDS207YWH0 KEDS207YWH1 KEDS207YWH2 KEES702SWB0 KEES702SWB1 KERS500SWB0 KERS500SWB1 KERS502SWB0 KERS502SWB1 L8610PV L8610RV LCNE200 LDG210 LDG212 LDG412 MEC4430ACW MEC4430ACW14 MEC4436AAB10 MEC4436AAC10 MEC4436AAW10 MEC4536WB00 MEC4536WC00 MEC4536WW00 MER4351AGW MER5520AAQ MER5520AAW N3832XRA N3832XRW NEA3G8AC NEA3G8CV NEA3G8CX NEA3G8EV NEA3G8EVW NEA3H2EX NEA3J8EV NEA6H6CLW NECA86-1 NECW86-1 NEHA86-1 NEHW86-1 NEW3G8AC NEW3G8CV NEW3G8CX NEW3G8EV NEW3G8EVW NEW3H2EX NEW3J8EV NEW6H6CLW RC8100XAW0 RC8200XBH0 RC8200XBH1 RC8200XBH2 RC8200XBN0 RC8200XBN1 RC8200XBW0 RC8200XBW1 RC8200XBW2 RC8200XBZ1 RC8200XBZ2 RC8200XKS0 RC8200XKW1 RC8200XVW0 RC8200XVW1 RC8200XYW0 RC8200XYW1 RC8200XYW2 RC8300XKH RC8300XLH RC8300XPH RC8400XAB0 RC8400XAB1 RC8400XAH0 RC8400XAH1 RC8400XAN0 RC8400XAN1 RC8400XAQ0 RC8400XAQ1 RC8400XBB0 RC8400XBB1 RC8400XBB2 RC8400XBH0 RC8400XBH1 RC8400XBH2 RC8400XBN0 RC8400XBN1 RC8400XBQ0 RC8400XBQ1 RC8400XBQ2 RC8400XBW1 RC8400XBZ1 RC8400XBZ2 RC8400XKW1 RC8400XVW0 RC8400XVW1 RC8400XYQ0 RC8400XYW0 RC8800XLH RC8800XPH RC8900XAB0 RC8900XAH0 RC8900XAQ0 RC8900XAQ1 RC8900XMH0 RC8900XXB0 RC8900XXQ0 RC8900XXW0 RC8920XAH0 RC8920XRH0 RC8920XRH1 RC8920XRH2 RC8920XRH3 RC8950XRH7 RCK889 RCK986 RCS3014GB0 RCS3014GB1 RCS3014GQ0 RCS3014GQ1 RCS3014GS0 RCS3014GS1 RCS3014GT0 RCS3014GT1 RCS3014GZ0 RCS3014LB0 RCS3014LS0 RCS3014LT0 RCS3014RB00 RCS3014RB01 RCS3014RB02 RCS3014RB05 RCS3014RQ00 RCS3014RQ01 RCS3014RQ02 RCS3014RQ04 RCS3014RS00 RCS3014RS01 RCS3014RS02 RCS3014RS04 RCS3014RT00 RCS3014RT01 RCS3014RT02 RCS3014RT04 RCS3514GB0 RCS3614GB0 RCS3614GB1 RCS3614GQ0 RCS3614GQ1 RCS3614GS0 RCS3614GS1 RCS3614GT0 RCS3614GT1 RCS3614GZ0 RCS3614LB0 RCS3614LQ0 RCS3614LS0 RCS3614LT0 RCS3614RB00 RCS3614RB01 RCS3614RQ00 RCS3614RQ01 RCS3614RS00 RCS3614RS01 RCS3614RT00 RCS3614RT01 RE953PXPT2 RE960PXPW2 RE960PXVW0 RE960PXVW1 RE960PXVW3 RE960PXVW4 RE960PXVW5 RE960PXYW0 RE960PXYW1 RE963PXPT2 RF010EXRW1 RF114PXSB0 RF114PXSB1 RF114PXSB2 RF114PXSB3 RF114PXSQ0 RF114PXSQ1 RF114PXSQ2 RF114PXSQ3 RF114PXST0 RF114PXST1 RF114PXST2 RF114PXST3 RF261PXSQ0 RF261PXSQ1 RF261PXST0 RF261PXST1 RF261PXSW0 RF261PXSW1 RF263LXTB0 RF263LXTB1 RF263LXTB2 RF263LXTB3 RF263LXTQ0 RF263LXTQ1 RF263LXTQ2 RF263LXTQ3 RF263LXTS0 RF263LXTS1 RF263LXTS2 RF263LXTS3 RF263LXTT0 RF263LXTT1 RF263LXTT2 RF263LXTT3 RF263LXTW0 RF263LXTW1 RF263LXTW2 RF264LXSB0 RF264LXSB1 RF264LXSB2 RF264LXSB3 RF264LXSQ0 RF264LXSQ1 RF264LXSQ2 RF264LXSQ3 RF264LXST0 RF264LXST1 RF3000XPW0 RF3000XVW0 RF3000XVW1 RF3000XVW2 RF3000XVW3 RF3010XPW0 RF3020XDN0 RF3020XDW0 RF3020XPW0 RF3020XVF0 RF3020XVG0 RF3020XVM0 RF3020XVN0 RF3020XVN1 RF3020XVN2 RF3020XVW0 RF3020XVW1 RF3020XVW2 RF3020XVW3 RF3020XXN0 RF3020XXN1 RF3020XXN2 RF3020XXW0 RF3020XXW1 RF3020XXW2 RF3020XYN0 RF3020XYN1 RF3020XYN2 RF3020XYW0 RF3020XYW1 RF3020XYW2 RF302BXDN0 RF302BXDQ0 RF302BXDQO RF302BXDW0 RF302BXPW0 RF302BXVF0 RF302BXVG0 RF302BXVG1 RF302BXVG2 RF302BXVG3 RF302BXVM0 RF302BXVN0 RF302BXVN1 RF302BXVN2 RF302BXVN3 RF302BXVW0 RF302BXVW1 RF302BXVW2 RF302BXVW3 RF302BXXG1 RF302BXXG2 RF302BXXN0 RF302BXXN1 RF302BXXN2 RF302BXXQ0 RF302BXXQ1 RF302BXXQ2 RF302BXXW0 RF302BXXW1 RF302BXXW2 RF302BXYG0 RF302BXYG1 RF302BXYG2 RF302BXYN0 RF302BXYN1 RF302BXYN2 RF302BXYQ0 RF302BXYQ1 RF302BXYQ2 RF302BXYW0 RF302BXYW1 RF302BXYW2 RF302EXPW0 RF302PXXQ0 RF302PXXQ1 RF303BXPW0 RF305EXPW0 RF305PXDN0 RF305PXDQ0 RF305PXDW0 RF305PXDZ0 RF306BXPW0 RF306BXVN0 RF306BXVW0 RF306BXVW1 RF306BXVW2 RF306BXVW3 RF3100XPW0 RF3100XVN2 RF3100XVW0 RF3100XVW1 RF3100XVW2 RF3100XVW3 RF3105XXN0 RF3105XXN1 RF3105XXN2 RF3105XXW0 RF3105XXW1 RF3105XXW2 RF310BXYW0 RF310BXYW1 RF310BXYW2 RF310PXAW0 RF310PXDN0 RF310PXDQ0 RF310PXDW0 RF310PXDZ0 RF310PXPW0 RF310PXVF0 RF310PXVG0 RF310PXVM0 RF310PXVN0 RF310PXVW0 RF310PXVW1 RF310PXVW2 RF310PXVW3 RF310PXXW0 RF310PXXW1 RF310PXXW2 RF310PXYW0 RF310PXYW1 RF3120XPW0 RF313PXPT0 RF313PXVT0 RF315PCYN0 RF315PCYW0 RF315PCYW1 RF315PCYW2 RF315PXDN0 RF315PXDQ0 RF315PXDW0 RF315PXDZ0 RF315PXEN0 RF315PXEQ0 RF315PXEW0 RF315PXGN0 RF315PXGN1 RF315PXGQ0 RF315PXGQ1 RF315PXGT1 RF315PXGV1 RF315PXGW0 RF315PXGW1 RF315PXKB0 RF315PXKQ0 RF315PXKT0 RF315PXKV0 RF315PXKW0 RF315PXMB0 RF315PXMQ0 RF315PXMT0 RF315PXMV0 RF315PXMW0 RF315PXPB0 RF315PXPB1 RF315PXPB2 RF315PXPB3 RF315PXPQ0 RF315PXPQ1 RF315PXPQ2 RF315PXPQ3 RF315PXPT0 RF315PXPT1 RF315PXPT2 RF315PXPT3 RF315PXXG1 RF315PXXG2 RF315PXXN0 RF315PXXN1 RF315PXXN2 RF315PXXW0 RF315PXXW1 RF315PXXW2 RF315PXYG0 RF315PXYG1 RF315PXYG2 RF315PXYN0 RF315PXYN1 RF315PXYN2 RF315PXYW0 RF315PXYW1 RF315PXYW2 RF3165XPW0 RF3165XVN0 RF3165XVW0 RF3165XWG1 RF3165XWN0 RF3165XWN1 RF3165XWW0 RF3165XWW1 RF3165XWW2 RF316EXPW0 RF3210XPW0 RF325PXEN0 RF325PXEQ0 RF325PXEW0 RF325PXEZ0 RF325PXGN0 RF325PXGN1 RF325PXGQ0 RF325PXGQ1 RF325PXGW0 RF325PXGW1 RF325PXGZ0 RF325PXGZ1 RF3300XPW0 RF3300XVW0 RF3300XVW1 RF3300XVW2 RF3300XVW3 RF3305XXN0 RF3305XXN1 RF3305XXW0 RF3305XXW1 RF3305XXW2 RF330PXAW0 RF330PXDN0 RF330PXDQ0 RF330PXDW0 RF330PXDZ0 RF330PXPW0 RF330PXVW0 RF330PXVW1 RF330PXVW2 RF330PXVW3 RF330PXXW0 RF330PXXW1 RF330PXXW2 RF330PXYW0 RF330PXYW1 RF332BXPW0 RF333PXPT0 RF333PXVT0 RF335EXPW0 RF3365XPW0 RF3365XVW0 RF3365XWW0 RF3365XWW1 RF3365XWW2 RF336EXPW0 RF336PXPW0 RF345PXPW0 RF350BXBW0 RF350BXDW0 RF350PXPW0 RF3600XPW0 RF3600XPW1 RF3600XXW0 RF3600XXW1 RF3600XXW2 RF3600XYW0 RF3600XYW1 RF3600XYW2 RF360BXDN0 RF360BXDW0 RF360BXPW0 RF360BXVW0 RF360BXWW0 RF360BXWW1 RF360BXWW2 RF360BXXN0 RF360BXXN2 RF360BXXN3 RF360BXXW0 RF360BXXW1 RF360BXXW2 RF360BXXW3 RF360BXYN0 RF360BXYW0 RF360BXYW1 RF360BXYW2 RF360EXPW0 RF3615XWW1 RF361BXDN0 RF361BXDW0 RF361PXXW0 RF361PXXW1 RF361PXXW2 RF3620XPW0 RF3620XPW1 RF3620XVW0 RF3620XVW1 RF3620XVW2 RF3620XVW3 RF362BBDN0 RF362BBDQ0 RF362BBDW0 RF362BBDZ0 RF362BXBN1 RF362BXBQ1 RF362BXBW0 RF362BXBW1 RF362BXGN0 RF362BXGN1 RF362BXGQ0 RF362BXGQ1 RF362BXGT1 RF362BXGV1 RF362BXGW0 RF362BXGW1 RF362BXKQ0 RF362BXKQ1 RF362BXKT0 RF362BXKT1 RF362BXKV0 RF362BXKV1 RF362BXKW0 RF362BXKW1 RF362BXMQ0 RF362BXMT0 RF362BXMV0 RF362BXMW0 RF363PXDN0 RF363PXDW0 RF363PXPT0 RF363PXPT1 RF363PXVT0 RF363PXVT1 RF363PXVT2 RF363PXVT3 RF365BXPW0 RF365BXPW1 RF365BXVN0 RF365BXVW0 RF365BXWM1 RF365BXWM2 RF365BXWN0 RF365BXWN1 RF365BXWN2 RF365BXWW0 RF365BXWW1 RF365BXWW2 RF365BXYN0 RF365BXYN1 RF365BXYW0 RF365BXYW1 RF365EXPW0 RF365EXPW1 RF365PXDN0 RF365PXDQ0 RF365PXDW0 RF365PXDZ0 RF365PXGN0 RF365PXGN1 RF365PXGQ0 RF365PXGQ1 RF365PXGT1 RF365PXGW0 RF365PXGW1 RF365PXKQ0 RF365PXKT0 RF365PXKV0 RF365PXKW0 RF365PXMQ0 RF365PXMQ1 RF365PXMQ2 RF365PXMQ3 RF365PXMT0 RF365PXMT1 RF365PXMT2 RF365PXMT3 RF365PXMV0 RF365PXMV1 RF365PXMV2 RF365PXMW0 RF365PXMW1 RF365PXMW2 RF365PXMW3 RF365PXWW0 RF365PXXN0 RF365PXXN1 RF365PXXN2 RF365PXXW0 RF365PXXW1 RF365PXXW2 RF365PXYN0 RF365PXYN1 RF365PXYN2 RF365PXYQ0 RF365PXYQ1 RF365PXYQ2 RF365PXYW0 RF365PXYW1 RF365PXYW2 RF365PXYZ2 RF367LXKB0 RF367LXKQ0 RF367LXKT0 RF367LXKV0 RF367LXKW0 RF367LXMB0 RF367LXMQ0 RF367LXMT0 RF367LXMV0 RF367LXMW0 RF367PXDN0 RF367PXDW0 RF369LXPB0 RF369LXPB1 RF369LXPB2 RF369LXPB3 RF369LXPQ0 RF369LXPQ1 RF369LXPQ2 RF369LXPQ3 RF369LXPT0 RF369LXPT1 RF369LXPT2 RF370LXGN0 RF370LXGW0 RF370PXDN0 RF370PXDW0 RF370PXGQ0 RF370PXGQ1 RF370PXGZ0 RF370PXGZ1 RF370PXYN0 RF370PXYW0 RF370PXYW1 RF370PXYW2 RF372BXEN0 RF372BXEQ0 RF372BXEW0 RF372BXEZ0 RF3750XPW0 RF3750XPW1 RF375PCYN3 RF375PCYW0 RF375PCYW1 RF375PCYW2 RF375PCYW3 RF375PXDN0 RF375PXDQ0 RF375PXDW0 RF375PXDZ0 RF375PXEN0 RF375PXEQ0 RF375PXEW0 RF375PXEZ0 RF375PXPW0 RF375PXPW1 RF375PXVW0 RF375PXVW1 RF375PXWW0 RF375PXWW1 RF375PXWW2 RF375PXXW0 RF375PXXW1 RF375PXXW2 RF375PXYB1 RF375PXYB3 RF375PXYN3 RF375PXYQ3 RF375PXYW0 RF375PXYW1 RF375PXYW2 RF375PXYW3 RF377PXGB0 RF377PXGB1 RF377PXGB5 RF377PXGN0 RF377PXGN1 RF377PXGN5 RF377PXGQ0 RF377PXGQ1 RF377PXGQ5 RF377PXGT1 RF377PXGV1 RF377PXGW0 RF377PXGW1 RF377PXGW5 RF377PXGZ0 RF377PXGZ1 RF377PXGZ5 RF379LXKB0 RF379LXKQ0 RF379LXKQ1 RF379LXKT0 RF379LXKT1 RF379LXMQ0 RF379LXMT0 RF3850XVW0 RF385PCVW0 RF385PCWW0 RF385PCWW1 RF385PCWW2 RF385PXDQ0 RF385PXEN0 RF385PXEQ0 RF385PXEW0 RF385PXEZ0 RF385PXGB1 RF385PXGB2 RF385PXGN0 RF385PXGN1 RF385PXGN2 RF385PXGQ0 RF385PXGQ1 RF385PXGQ2 RF385PXGT2 RF385PXGW0 RF385PXGW1 RF385PXGW2 RF385PXGZ0 RF385PXGZ1 RF385PXGZ2 RF385PXPW0 RF385PXPW1 RF385PXVW0 RF385PXWW0 RF385PXWW1 RF385PXWW2 RF385PXYN4 RF385PXYQ4 RF385PXYW0 RF385PXYW1 RF385PXYW2 RF385PXYW3 RF385PXYW4 RF387LXGN0 RF387LXGN1 RF387LXGQ0 RF387LXGQ1 RF387LXGW0 RF387LXGW1 RF387LXHQ0 RF387LXHQ1 RF387LXHT1 RF387LXHZ0 RF389LXKB0 RF389LXKQ0 RF389LXKT0 RF390PXPW0 RF390PXVN0 RF390PXVW0 RF390PXWN0 RF390PXWN1 RF390PXWN2 RF390PXWW0 RF390PXWW1 RF390PXWW2 RF391PXWW0 RF391PXWW1 RF391PXXW0 RF391PXXW1 RF391PXXW2 RF395LXEB0 RF395LXEQ0 RF395LXEZ0 RF395PCXW0 RF395PCXW1 RF395PCXW2 RF395PXPW0 RF395PXPW1 RF395PXVW0 RF395PXWW0 RF395PXWW1 RF395PXWW2 RF395PXXN0 RF395PXXN1 RF395PXXN2 RF395PXXW0 RF395PXXW1 RF395PXXW2 RF398PXPW0 RF398PXPW1 RF398PXVW0 RF398PXWW0 RF398PXWW1 RF398PXWW2 RF4400XLW0 RF4400XLW1 RF4400XLW2 RF4400XLW3 RF4400XLW4 RF4700XBN0 RF4700XBN1 RF4700XBN2 RF4700XBN3 RF4700XBN4 RF4700XBW0 RF4700XBW1 RF4700XBW2 RF4700XBW3 RF4700XBW4 RF4700XEN0 RF4700XEN1 RF4700XEN3 RF4700XEN5 RF4700XEN6 RF4700XEW0 RF4700XEW1 RF4700XEW3 RF4700XEW5 RF4700XEW6 RF4700XEW8 RF4700XEW9 RF4700XWW0 RF4700XWW1 RF4700XWW2 RF4700XWW3 RF4900XLW0 RF4900XLW1 RF4900XLW2 RF4900XLW3 RF4900XLW4 RGE3010W1 RGE3010W2 RGE3210W0 RGE4900W1 RGE8300H RGE8800H RHE396PP RHE6760P RJE3000W1 RJE3020W1 RJE3021W1 RJE302BW1 RJE310PW0 RJE313PP RJE313PP1 RJE3165W0 RJE3165W1 RJE320BW1 RJE330PW0 RJE333PP1 RJE3365W0 RJE345PW0 RJE363PP1 RJE363PP2 RJE365BW0 RJE3750W0 RJE3750W1 RJE3750W2 RJE385PW0 RJE385PW1 RJE390PW RJE395PW0 RJE395PW1 RM955PXPW1 RM973BXPT1 RM973BXST0 RM978BXPW1 RM978BXSN0 RM978BXSW0 RM978BXVW0 RM978BXVW1 RM978BXVW2 RM980PXYW0 RM980PXYW1 RM988PXPW1 RM988PXSW0 RM988PXVF1 RM988PXVM1 RM988PXVN0 RM988PXVN1 RM988PXVW0 RM988PXVW1 RM988PXVW2 RM988PXVW3 RM988PXVW4 RM988PXVW5 RM988PXVW6 RS313PXYH0 RS313PXYH2 RS363BXTT0 RS363BXTT1 RS363BXTT2 RS363PCYW1 RS363PXYH0 RS363PXYH2 RS363PXYQ0 RS363PXYQ2 RS373PXW3 RS373PXWT0 RS373PXWT1 RS373PXWT2 RS373PXWW0 RS576PXL0 RS576PXL1 RS576PXP0 RS576PXP1 RS600BXBH0 RS600BXBH1 RS600BXBH2 RS600BXK1 RS600BXK2 RS600BXV0 RS600BXV1 RS600BXV2 RS600BXYH0 RS600BXYH1 RS600BXYH2 RS600BXYH3 RS600BXYH4 RS6100XKW0 RS6100XKW1 RS6100XKW2 RS6100XKW3 RS6100XVW0 RS6100XVW1 RS6100XVW2 RS6105XYN5 RS6105XYN6 RS6105XYN7 RS6105XYW0 RS6105XYW1 RS6105XYW2 RS6105XYW3 RS6105XYW4 RS6105XYW5 RS6105XYW6 RS6105XYW7 RS610PXEN0 RS610PXEN2 RS610PXEW0 RS610PXEW2 RS610PXK0 RS610PXK1 RS610PXK2 RS610PXK3 RS610PXV0 RS610PXV1 RS610PXV2 RS610PXYH0 RS610PXYH1 RS610PXYH2 RS610PXYH3 RS610PXYH4 RS6300XKW0 RS6300XKW1 RS6300XKW2 RS6300XKW3 RS6300XVN0 RS6300XVW0 RS6300XVW1 RS6300XVW2 RS6305XYN5 RS6305XYN6 RS6305XYW0 RS6305XYW1 RS6305XYW2 RS6305XYW3 RS6305XYW4 RS6305XYW5 RS6305XYW6 RS630PXBH0 RS630PXBH1 RS630PXK0 RS630PXK1 RS630PXK2 RS630PXK3 RS630PXV0 RS630PXV1 RS630PXV2 RS630PXYH0 RS630PXYH1 RS630PXYH2 RS630PXYH3 RS630PXYH4 RS660BXBH0 RS660BXBH1 RS660BXBH2 RS660BXK0 RS660BXK1 RS660BXK2 RS660BXK3 RS660BXK4 RS660BXV0 RS660BXV1 RS660BXV2 RS660BXYH0 RS660BXYH1 RS660BXYH2 RS660BXYH3 RS6700XKW0 RS6700XKW1 RS6700XKW2 RS6700XKW3 RS6700XKW4 RS6700XVW0 RS670PXK0 RS670PXK1 RS670PXK2 RS670PXK3 RS670PXK4 RS670PXV0 RS6750XV1 RS6750XVW0 RS6750XVW1 RS6750XVW2 RS6755XYN1 RS6755XYN5 RS6755XYN6 RS6755XYN7 RS6755XYW0 RS6755XYW1 RS6755XYW2 RS6755XYW5 RS6755XYW6 RS6755XYW7 RS675PXBH0 RS675PXBH1 RS675PXBH2 RS675PXBQ0 RS675PXBQ1 RS675PXBQ2 RS675PXEB0 RS675PXEB2 RS675PXEQ0 RS675PXEQ2 RS675PXEZ0 RS675PXEZ2 RS675PXGB0 RS675PXGB10 RS675PXGB12 RS675PXGB14 RS675PXGB15 RS675PXGB4 RS675PXGB5 RS675PXGB6 RS675PXGB7 RS675PXGB8 RS675PXGB9 RS675PXGQ0 RS675PXGQ10 RS675PXGQ12 RS675PXGQ14 RS675PXGQ15 RS675PXGQ4 RS675PXGQ5 RS675PXGQ6 RS675PXGQ7 RS675PXGQ8 RS675PXGQ9 RS675PXGT10 RS675PXGT12 RS675PXGT14 RS675PXGT15 RS675PXGT5 RS675PXGT7 RS675PXGT8 RS675PXGT9 RS675PXGZ0 RS675PXGZ4 RS675PXGZ5 RS675PXGZ6 RS675PXK0 RS675PXK1 RS675PXV0 RS675PXV1 RS675PXV2 RS675PXYH0 RS675PXYH2 RS675PXYQ0 RS675PXYQ1 RS675PXYQ2 RS676PXEQ0 RS676PXEZ0 RS676PXL0 S1068H-CZW S1151L-30 S1151L-36G S38FA-2CX-94 S38FK-2CX-94 S38FK-2CX-OC S38FY-2CX-94 S58H-2CXW S65HA-3LX S65HN-3LX S68HA-3CXW S68HK-3CXW S958J-LZW SES370XX0 TEP325KW0 TEP325MW0 TER20W0DW0 TER20W0YW0 TER20W0YW1 TER20W0YW2 TER20W0YW3 TER46W0WN1 TER46W0WW0 TER46W0WW1 TER46W0WW2 TER46W0YW0 TER46W0YW1 TER46W0YW2 TER50W0DW0 TER50W0DW1 TER56W2BN0 TER56W2BW0 TES325KQ0 TES325MQ0 TES325MQ1 TES325MQ2 TES325MQ3 TES325MQ4 TES325MQ5 TES325MT4 TES325MT5 TES325VQ0 TES325VT0 TES326RD0 TES326RD1 TES326RD2 TES326RD3 TES326RD4 TES326VD0 WBC31002 WBC31022 WBC31023 WERC3100PQ0 WERC3100PQ1 WERC3100PQ2 WERE3000PB4 WERE3000PB5 WERE3000PQ0 WERE3000PQ1 WERE3000PQ2 WERE3000PQ4 WERE3000PQ5 WERE3000SB0 WERE3000SB1 WERE3000SB2 WERE3000SQ0 WERE3000SQ1 WERE3000SQ2 WERE3100PQ0 WERE3100PQ1 WERE3100PQ2 WERE3110PQ0 WERE3110PQ1 WERP3000PB4 WERP3000PQ0 WERP3000PQ1 WERP3000PQ2 WERP3000PQ3 WERP3000PQ4 WERP3100PB0 WERP3100PB1 WERP3100PB2 WERP3100PB3 WERP3100PB4 WERP3100PQ0 WERP3100PQ1 WERP3100PQ2 WERP3100PQ3 WERP3100PQ4 WERP3100PS0 WERP3100PS1 WERP3100PS2 WERP3100PS3 WERP3100PS4 WERP3100PT0 WERP3100PT1 WERP3101SB0 WERP3101SB1 WERP3101SB2 WERP3101SQ0 WERP3101SQ1 WERP3101SQ2 WERP3101SS0 WERP3101SS1 WERP3101SS2 WERP3120PB0 WERP3120PB1 WERP3120PB2 WERP3120PB3 WERP3120PQ0 WERP3120PQ1 WERP3120PQ2 WERP3120PQ3 WERP3200PQ0 WERP3200PQ1 WERP3200PQ2 WFE115LXB0 WFE115LXQ0 WFE260LXS0 X8610RA X8610RT X8610RV YKERI204PB0 YKERI204PB1 YKERI204PB2 YKERI204PW0 YKERI204PW1 YKERI204PW2 YKERI204PW3 YMER7660WB0 YMER7660WB1 YMER7660WS0 YMER7660WS1 YMER7660WW0 YMER7660WW1 YRF115LXVB0 YRF115LXVQ0 YRF115LXVS0 YRF263LXTB0 YRF263LXTQ0 YRF263LXTS0. Our mission is to become the #1 source for all your appliance part needs. We will attempt to process your address change, cancellation and order change as quickly as possible. However, we cannot guarantee that we will be able to provide this service. Please review your order for accuracy before submitting it. The time frame depends on your location and is determined by the Post Office. You may go to their website and click "Calculate a Price" to determine if your package will take one or two days to deliver. Tracking information is accessible once the item is delivered to the post office or picked up by UPS. These charges are not refundable for all correctly filled orders. Please review the entire listing carefully and make certain you are ordering the part you need. Please note that appliance manufacturers frequently update their parts without warning. While we strive to update our listing pictures as quickly as possible, an outdated picture is not grounds for return. You must obtain a return authorization to return the part within this time frame. Parts are not eligible for return for any reason if we are not notified within the 14 day time frame. The item "Whirlpool Maytag Magic Chef Jenn-Air Range Stove 6 Surface Burner Y04000034" is in sale since Thursday, June 14, 2012. This item is in the category "Home & Garden\Major Appliances\Ranges & Cooking Appliances\Parts & Accessories". The seller is "generalapplianceparts" and is located in Louisville, Kentucky. This item can be shipped worldwide.